After World War II ended, a large-scale clean-up was set in motion. The town had to be made ready for buildings before the reconstruction, a reconstruction that looked for the emergence of a whole new, ideal seaside resort which would be geared towards mass tourism. This plan, however, was thought to be too extravagant and came to nothing. In 1950 the Boulevard Paulus Loot was constructed and in 1951 De Favaugeplein and the café-restaurant Paviljoen Zuid. At the Badhuisplein a semicircular flight of steps was constructed to lead down from each side to the beach, and the planned hotel for the site appeared in 1952 as the Bouwes Hotel (it stood on the site of the present-day casino). Its architect, Jan Wils, had been responsible for the Olympic Stadium in Amsterdam. In 1976 the hotel was given the addition of a casino but the entire complex was knocked down in 1987. 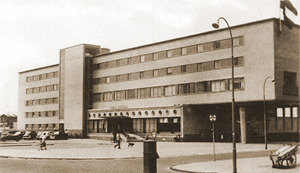 During the early 1950s numerous flats, villas and hotels began to appear in Zandvoort – hotels such as Hotel Zuiderbad on Boulevard Paulus Loot which opened its doors in 1953. 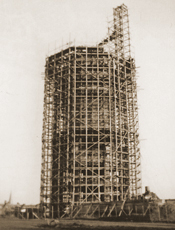 The 14-storey apartment complex, De Rotonde (designed by A. Komter) appeared on the Baduisplein in 1954.